Michalis Lapidakis was born in Thessaloniki, Greece in 1960. He began his musical studies at the State Conservatory of Thessaloniki where he studied piano with G. Thymis, harmony, counterpoint and fugue with Th. 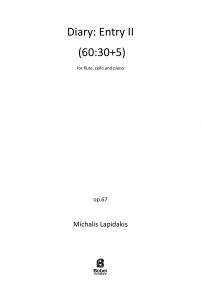 Mimikos and K. Nikitas. In 1988 he earned a Master's degree (M.M) in Composition at Boston University where he studied with Th. Antoniou and B. Rands and in 1993 a Doctoral degree (D.M.) in Composition at Northwestern University where he studied with A. Stout and W. Karlins. 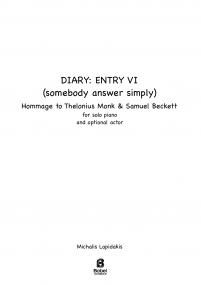 He has attended composition seminars with O. Messiaen, P. Boulez, T. Takemitsu and I. Xenakis among others. 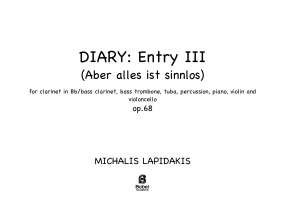 His compositional output includes works for orchestra (Five Pieces, Three Portraits, ΔIAΔPOMH (Route E-75),Narration: to compose the serenity, In a Sate of Flux IIa, Improptu Noir), various instrumental ensembles (Vera Quartet,Entweder Oder, the “Diary” series, Triptych,Howl), solo intruments(Five Preludes, Prespectives, Comments on a Theme, Akira's Dream, Ein andrer Hauch, Taxims), voice (Days, Un soleil noir, Go End There),instruments with electronics (Die Niemandsrose,Pop erotique) that have been performed in Greece (Athens and Thessaloniki Concert Halls) and internationally (Carnegie Hall, Konzerthaus Wien among others). He has received commissions by orchestras and contemporary music ensembles like Camerata, Symphony Orchestra of Bulgaria, Orchestra of Colours, dissonArt ensemble, Alea III, IAMA trio, UMS ‘n JIP, Interface ensemblee.t.c. and institutions like Athens Concert Hall, Cultural City of Europe 1997, Greek Radio e.t.c. 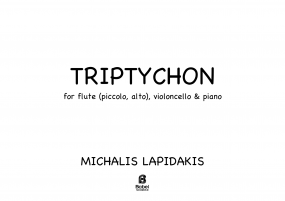 His works have been published by the music house "Philippos Nakas" and have appeared with various labels (Capstone Records, Lyra, Dissonance Records,e.t.c.). M.L. has also written music for multi-media productions, theater (Tempest by Shakespeare, The new Adventures of Don Quixote by V. Ziogas, The Return of Che by J. Chrissoulis) and contemporary dance (Attractorsfor the dance ensemble Dancers). 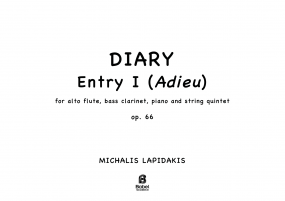 He has written several articles about contemporary music at Greek musicological journals and has given lectures at various conferences. 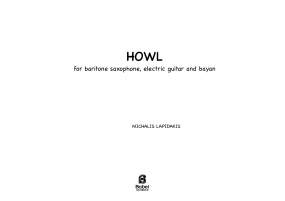 A large part of his music is based on literary and other exramusical sources whereas in all his music one can trace the composer’s tendency to integrate the strict organization of musical structures with a deep respect for the unexpectedness of true improvisation. 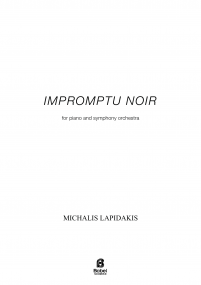 As a review indicates “Lapidakis displays an intoxicated and elemental fascination with what in German would be called Stoff (a more polysemic term than “material”), and hearing him generate and manipulate it was like watching elaborate wooden curios being hand-turned.” Michalis Lapidakis has been the artistic director of the Municipal Conservatory of Petroupolis in Athens (1993-2001) and taught advanced theory and composition at the Department of Musical Studies of the Ionion University (1996-2000). 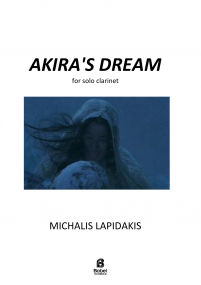 In 2000 he has been elected Assistant Professor of Composition at the School of Musical Studies of the Aristotle University of Thessaloniki. 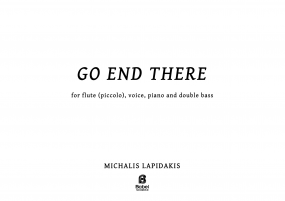 Since 2013 Michalis Lapidakis is Professor of Composition. 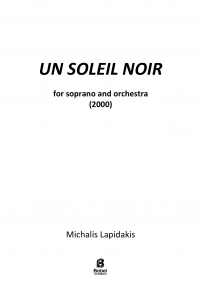 In 2009 he founded the Contemporary Music Lab of A.U.Th.Since 2013 he is the Head of the School of Musical Studies of the Aristotle University of Thessaloniki.He is a member of the Greek Composers’ Union.